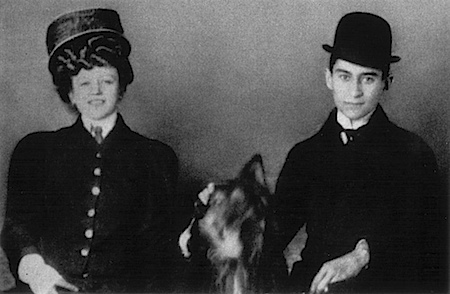 Contrary to popular belief, Kafka had a very full love life. He was rarely without a lady friend during any part of his life. When one left, another soon took her place. This is a part of a letter he wrote to Felice, the woman he was engaged to – twice. I think it fair to say that she was long-suffering. I would think that the sentiments Kafka expresses might have given her second thoughts. Perhaps that is partly why there were two engagements. Think what one will about Kafka’s romantic abilities, he was a chick magnet. Right to the end. After his funeral his last lover had to be restrained from leaping into his grave to be with him. While in the first year of his ‘love-of-a-lifetime’ affair with Felice Bauer, he met “The Swiss Girl”. In his diaries she was only referred to as W. or G. W. They were together for ten days in a spa on Lake Garda. 04 June 1917Sometimes – with F – a kiss could make me feel I was becoming part of her. And she into me. I retreated. Had I not retreated, I would have given up myself. This is what is expected from love. My thoughts and emotions would be continually extracted. I have no way to replenish them, so I would eventually be hollowed out. And I would collapse. I will meet Felice – it is what she wants. It is what must be done. She is coming to Prague, and will no doubt fit in perfectly. My parents approve of her – more, I suspect, than they approve of me. She’ll be insulted by this tiny house – it will be found wanting and crude. Some of those annoying qualities she hints about me.